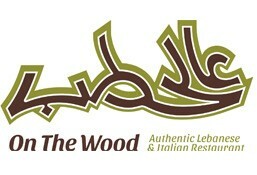 On The Wood is currently closed for delivery and it will open at . Made of 200 grams of cracked wheat and finely ground lean beef stuffed with cooked minced beef, onions and flavored with lebanese traditional spices. served with hommos dip and pomegranate molasses, house salad and your choice of three pieces of bread. Minced chicken tawouk, french fries, tawouk garlic sauce and pickles. Minced beef shawarma, biwaz [onion, parsley and sumac], pickles, grilled tomato and tahina sauce. Hummus with shawarma sauce topped with tawouk, green capsicum, and fresh mushroom. All hummus plates served with vegetable plate and fresh bread. Thyme, labneh, baked white onion and rocca leaves. Light life oil and zaatar. Light life oil and cheese akawi. Akawi cheese and mix cheese. Light life oil, zaatar and labneh. Light life oil cheese akawi and zaatar. Chili sauce and kashkaval cheese. Light life oil labneh and olive oil. Fresh creamy labneh, pesto sauce, tomato, rocca leaves. Mortadelle, kashkaval cheese, lettuce, tomato, pickles and mustard sauce. Light life oil, mozarella cheese, black seeds, hallomi cheese. Spinach vegetables and akawi cheese. Lentil, crouton served with lemon wedges. Grilled chicken breast, fresh mushroom and cream sauce. Grilled halloumi, romain lettuce, rocca leaves, parmesan cheese, tomato, onion, fresh mushroom and balsamic dressing. Toasted bread, tomato, green onion, cucumber, romain lettuce, green capsicum, parsley, mint, pomegranate molasses, balsamic sauce and sumac. Rocca leaves, cherry tomato, cucumber, red capsicum, fresh mushroom, mint leaves, crouton,quinoa sauce, green olives sliced and beetroot. White quinoa, iceberg, rocca leaves, beetroots, carrot, feta cheese,cherry tomato,quinoa sauce and pomegranate. Parsley, tomato, onion spring, onion, white burgul, lemon juice, lettuce romaine. Parsley, tomato, onion spring, onion, olive oil, lemon juice, quinoa white. Grilled chicken breast, romaine lettuce, parmesan cheese, crouton and caesar dressing. Mixed cheese. Cucumber, avocado sauce, cherry tomato, red beans, grilled chicken breast, tortilla chips and carrot. Smoked salmon, romaine lettuce, crouton, oregano, Parmesan cheese and Caesar dressing. Akkawi cheese, Parmesan, mozzarella and cheddar cheese, pizza sauce. Fresh Broccoli, fresh mushroom, black olives, white onion, red capsicum, mozzarella cheese, baby corn, pizza sauce and garlic oil. Marinated chicken strips, fresh mushroom, mozzarella cheese, red capsicum, garlic oil and pizza sauce. Marinated chicken strips, tortilla chips, mixed cheese, joy sauce and avocado sauce. Pepperoni, Parmesan, mozzarella cheese, pizza sauce. Pepperoni, Parmesan, mozzarella cheese and joy sauce. Marinated chicken strips, black olives, sauteed mushroom, green onion, parsley, jalapeno, mix cheese, arrabbiata sauce and side guacamole sauce. Sauce pizza,akawi cheese, red capsicum, mushroom sauted, black olive &and Lebanese thyme. Pepperoni red capsicum, fresh cream, arrabiata swauce, and butter. Salmon, pasta penne, arrabiata sauce, cream sauce, onion spring, oregano, and parsley. Penne pasta, meat strips and cream sauce. [Spicy] Penne pasta, fresh mushroom, four cheese, chilli pepper, spicy sauce and cream sauce. Penne pasta, four cheese and fresh mixed cream sauce. Penne pasta, tomato sauce, basil, oregano, red chilli pepper, olive oil and Parmesan cheese. Thyme, labneh, tomato, turnip pickles, rocca leaves and mint leaves. Minced chicken tawouk, french fries, coleslaw, ketchup, tawouk garlic sauce and pickles. Smoked turkey, Kashkaval cheese, lettuce, tomato, pickles and mustard mayo sauce. Minced chicken fajita, mix cheese, lettuce, pickles, guacamole and chicken shawarma sauce. [Spicy] Beef Kebab, lettuce, tomato, jalapeno and Mexican sauce. Beef Kafta. Biwaz [onion, parsley and sumac], pickles, grilled tomato and tahina sauce. Pepperoni, french fries, mix cheese, coleslaw, pickles and cocktail sauce. Marinated chicken breast with pesto, mozzarella cheese, sundried tomato, rocca leaves and garlic sauce. Minced chicken shawarma, French fries, pickles and homemade garlic shawarma sauce. Sliced roast beef, mix cheese, tomato slice, pickles, lettuce, mint, lemon mustard sauce and steak sauce. Baked falafel, tomato, lettuce, mint, turnip pickles and tahina sauce. Baked falafel, hummos, lettuce, tomato, mint, turnip pickles and tahina sauce. Baked falafel, labneh, lettuce, tomato, turnip pickles, mint and tahina sauce. Hummus with avocado sauce topped with fajita, green onion, green capsicum, fresh mushroom and chilli sauce. All hummus plates served with vegetable plate and fresh bread. All hummus plates served with vegetable plate and fresh bread. Hummus topped with minced beef, tomato, onion, parsley, pomegranate molasses and pine seeds. Kunafa dough, akkawi sweet cheese, kunafa crumbs, andsugar syrup. One piece. Baked latayef dough, sweet cheese, mixed walnuts with brown sugar and blossom served with honey dip. Lemon fresh, fresh mint and sugar syrup of the juice. Fresh banana, fresh strawberry and strawberry syrup. Fresh watermelon, fresh strawberry and strawberry syrup. Fresh banana, fresh milk and sugar syrup for kunafa. Black and white oreo, fresh milk and sweetened milk. Pineapple juice, pineapple syrup, blue curacao and lemon juice. Carrot fresh, green apple fresh, lemon fresh, ginger fresh and sugar syrup. Green apple fresh, orange fresh, sugar syrup, ginger fresh and lemon juice. Green apple fresh, cucumber, ginger fresh, celery leaves and sugar syrup.